The 18-year-old proposed a federal secretariat for mental health and addiction. Noah Irvine speaks to reporters in the House of Commons in 2017. Last summer, Noah Irvine wanted to make some noise. The Guelph, Ont. 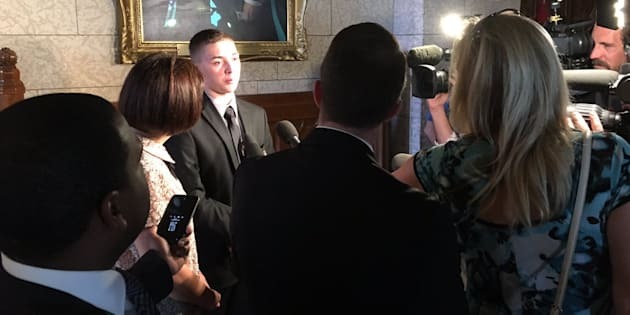 high school student, who lost his mother to suicide and his father to a prescription drug overdose by the time he was 15, had written a letter to every MP in Canada calling for more national action on mental health and addiction. "Please do not let my mother's death have been in vain or my father's death," Irvine wrote in the letters. "Both of their deaths and the thousands that die every year should fuel your fight in ending this crisis." Six months after he started sending them, Irvine told HuffPost Canada that the response rate to his messages was "abysmal" — about 40 MPs had responded. Some MPs even told him that their hands were tied as he wasn't a constituent. Frustrated but still hopeful, Irvine went to the media. After a storm of of headlines, and bad optics, the government and opposition parties began reaching out to Irvine. First came Jane Philpott, the health minister at the time, who apologized for the lack of response. Then-NDP leader Tom Mulcair also said he was sorry, according to Global News. Noah Irvine is seen on CTV's "The Social, where he was interviewed about the loss of his parents and his campaign to improve mental health services across Canada. Eventually, it was Prime Minister Justin Trudeau's turn to atone. Irvine spoke on the phone with the PM in October, like he did with Health Minister Ginette Petitpas Taylor a month prior, about the need for a national suicide prevention strategy and a federal mental health and addiction secretariat. Similar to the government's LGBTQ2 secretariat, the office would be devoted to spearheading national mental health initiatives and providing leadership to the provinces. The secretariat would also serve as a listening post for the prime minister, allowing his office to collect data on what is and isn't working across the country. Irvine said Petitpas Talyor said she was interested in the proposal and would take it back for discussion with her colleagues in cabinet. Trudeau, Irvine said, called it a "noble idea worth looking into." It seemed Irvine had finally made some noise. People at the highest levels of office in the land were listening and seemed keen to his proposal. Months later, his optimism appears to have disintegrated. Speaking to HuffPost Canada last week, a day after the Liberal government introduced its third federal budget — which included no commitments to a mental health secretariat — an audibly frustrated Irvine said he feels lied to. "I don't believe that they've looked into it," Irvine, 18, told HuffPost. "It is the definition of politics. They'll tell you one thing then they won't do it." Asked if she ever discussed the idea of establishing a secretariat with the federal cabinet after speaking to Irvine, Petitpas Taylor's office only told HuffPost that it commends Irvine's "resilience" and pointed to the 2017 and 2018 budgets' commitments to mental health. The former included a $5-billion investment over 10 years. The office also noted that it was exploring ways to pilot a "new approach" to identify "suicide-related behaviours" based on online data. Last week's federal budget earmarked new spending for gender-equality initiatives, a move that Irvine noted was positive and necessary. It dedicates funding for several mental health programs for veterans, inmates and residential school survivors. The budget also promises $10 million for research to explore the effects of cannabis on mental health. They heard the story of thousands of other Canadians, yet they ignored them. Irvine said that these investments are important and will benefit some Canadians, but they are still "patchwork funding" at best, and don't fix the lack of a centralized hub for mental health initiatives. "There was nothing to take us away from working in silos, working in closed off areas of the country. There's nothing to take us away from that in this new budget. "If anything ... they lied, they didn't do anything." Irvine's proposal isn't entirely new. He pointed to a 2011 report from a parliamentary committee on palliative and compassionate care, which recommended the government establish a suicide prevention secretariat. Irvine said he just wanted the position to be more encompassing. "They heard my parents' story. They heard the story of thousands of other Canadians, yet they ignored them. That's very disappointing, and I think any Canadian who has a loved one, a relative, anybody that they've lost to this, should be exceptionally disappointed in the federal government's lack of leadership on this." Patrick Smith, CEO of the Canadian Mental Health Association, said the funding outlined in the 2017 and 2018 budgets is a welcome step and specifically commended its initiatives for veterans and Indigenous Canadians. And though he agrees with Irvine that more concerted leadership is needed from Ottawa, he recognizes that there are barriers to enforcing nationwide initiatives. Noah Irvine is pictured speaking in favour of Bill 149, which aims to establish a mental health ministry in Ontario, with Ontario NDP Leader Andrea Horwath and the party's health critic France Gélinas. "The federal government saying we're going to fund [a program] across the country steps on the toes of the provinces. So the provinces say just send us the money and delivery of health services is a provincial matter. So that's part of the challenge." Irvine, citing a speech Philpott gave at Queen's University in 2011, said the government cannot continue being an "open wallet" to provinces. "We cannot continue on the path of inaction ... we can't. We should not be losing 4,000 Canadians every year. We should not be stumbling around in the dark with how to deal with this," he said. "Provinces and territories, along with the federal government, must collaborate on this far more than we are, and the secretariat is the place where we can start that multi-government co-operation within the country." Smith stressed that Canada's gap in mental health services was not created overnight and cannot be solved with one budget or through one sitting government. He noted that despite the commitments the Liberals have made so far, Canada's spending on mental health still trails most developed nations. "One of the challenges we have is that of all G7 countries we spend the lowest percentage of our healthcare budget on mental health," Smith said. "Even after all of these [investments], it's still not getting us out of last place. We're still at the bottom." "When we talk about spending the lowest percentage of our healthcare budget on mental health, that's not just a number. That's not just one year. If you've been doing this historically, it translates on the ground to absolute, dramatic gaps in basic services that other G7 countries have had for years." Another major challenge that future budgets need to address is equitable access to medication, Smith said. He hopes the government's newly-announced advisory group studying pharmacare will strike a balance between both affordable and high quality medications, such as antidepressants. He also wants the government to include frontline workers within the public system. "I think the biggest thing that I don't think most Canadians understand is [how] bad it is for us. We accept that in a country that has universal health care, social workers, psychologists mostly are not covered," he said. "We have task forces and things looking into how do we get those things into a healthcare system. That doesn't sound like a developed country." For Smith's organization, the 2018 budget is a sign that Ottawa recognizes the enormity of the situation and knows a long-term solution is the only way forward. "I think the first step is let's not pretend it's something that can be fixed in a federal budget in one year. The first thing they have to do is to name it and then to put things in place, and that's what we see this federal government doing." For Irvine, his fight for a mental health secretariat is far from over. "I'll continue to advocate for that for as long as I can," he said. "As long as people give me a place to speak."